The beach is beautiful and full of many awesome travelers. Great staff, answered all questions. Big help with motorbike rentals. Knew we got up early and we're ready with decent coffee. Very large bungalow, very basic but it's all you need. The room has a little porch with a chair with a sea view. The hotel had some issues with the booking and they upgraded my room - Bonus and great service. 2 hammocks on the front yard of the room, and plenty of hammocks on the beach near the main area. Lovely to hear the ocean sounds while in the room. the resort is just simply beautiful, u´re gonna falling in love with it. really really nice staff, all of them are so friendly, I miss them already. The Long set beach is so clean, and the Reef's so eco-friendly, they even do a garbage pick-up events every week to clean the beach, everyone participated will get a free beer and a free T-shirt. You're gonna be happy not by the physical things but by the experiences that you're gonna get here. highly recommended. The massage therapist on the beach was amazing. Cheap beer and cheap food. The bungalows were decent (although overpriced for Cambodia and the region) but no hammock or comfortable hanging space for more than one traveller. This is a hostel/backpacker place in terms of service and operations. Take note before booking. I personally had a brilliant few days on the island and at Reef On The Beach, so much so that I wish I could’ve stayed for longer but unfortunately I have work commitments that I needed to get back to. - The bungalow was spacious with a working fan and electricity. - The staff were helpful with any questions I had. - There were a range of organised activities/events for each day that were inclusive to all ages. - The food and drink prices were decent. 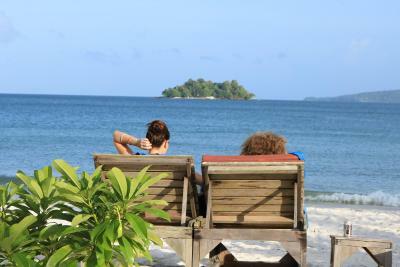 - A stunning beach and clear sea with comfortable seating and hammocks to help you enjoy your drinks. Amazing staff, really great plankton excursion and transportation to the nearby parties. 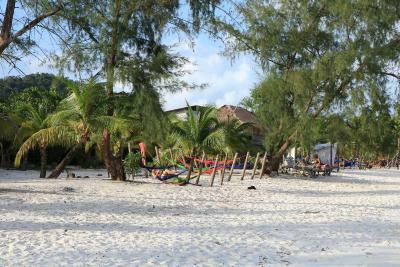 Great food, good nearby restaurant, beautiful clean beach, cool hammocks in the water, spacious tent with plugs and fan. Bathrooms are clean, rooms are neat and staff is extremely helpful! Recommended! Liam, the owner, was very helpful and accommodating. This resort offers a perfect balance of leisure and activities. Didn’t want to leave! Nice and chill area, hamocks are great! Beach is not very clean because of waves. Bungalows and tents are big and comfortable. Restaurant is okay for these prices, staff is ok but service very slow. One of our top picks in Koh Rong Island.Located right on 4K (Longset) Beach, Reef On The Beach offers beachfront accommodations in Koh Rong Island. 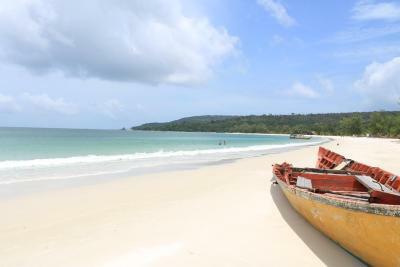 Accessible by ferry services, Reef On The Beach is a 30-minute walk to Koh Touch, while Sihanoukville is 17 mi away. There is a private bathroom with free toiletries in each unit. Towels and bed linen are available. You can engage in various activities, such as snorkeling, diving and canoeing. This property also has one of the top-rated locations in Koh Rong Island! Guests are happier about it compared to other properties in the area. When would you like to stay at Reef On The Beach (By Reef Resort)? House Rules Reef On The Beach (By Reef Resort) takes special requests – add in the next step! Reef On The Beach (By Reef Resort) accepts these cards and reserves the right to temporarily hold an amount prior to arrival. Please note that there is no cash machine (ATM) in Koh Rong Island. The property requires full payment of reservation upon arrival and a key deposit will also be charged. Please note that the property recommends 2 boat companies (Buva Sea Boat company or Speed Ferry Cambodia) offering boat transfers between Sihanoukville and Koh Rong Island at an additional charge. The drop-off place is on Longset Beach. The charge is to be paid directly to the boat companies. To noisy at night... They could put the door in othe direction to the sound doesn't go straight from the bar to the dorm.. And the toilet at least of the dorms are nasty...they could clean better the toilet and empty the garbege bin more often.. The location is good, in front of the beach. And the bar of the hostel is cool. Staff were far from approachable. Service generally bad. Awful toilet and shower facilities because the water is brown and smells like iron. All the toilets are stained. Ocean view bungalows should be avoided, so much more expensive to just be using the shared showers anyway because the one in the bungalow was gross. Bins overflowing on the beach which don’t seem to get changed very often. WiFi doesn’t work at all. Location is the best this thing this place has going for it. Amazing beach! Good cheap cocktails in happy hour. Pool table. The dorm was super hot. The fan wasn’t working and there was no daily clean service. Also the restaurant/common area was super hot as there wasn’t any air con/ fans. The atmosphere is great. The staff is super nice and the food was yummy. I was hardly treated like a paying customer from the time I arrived. Member of staff asked to show me to my room acted as if it were an annoying task and didn’t even take me all the way. In fact, very few of the western staff acted as if they were even working at all. I’m totally fine with staff having fun and drinking with the guests to add to the fun of the place but they were often rude or uninterested, and seemed to spend more time trying to hook up with guests or fellow staff than actually serve customers. There were countless mistakes made on food orders, not providing towels, and even saw a group miss their ferry boat because of wrong information given by staff - and apologies were few and far between. The lack of professionalism lost its charm quickly and it made for a stay that wasn’t nearly as enjoyable as it should’ve been given the location of this beautiful property. Beach was nice, crowd was great before staff had annoyed them all. The tent got very hot early in the morning, although with the beach on you doorstep we just went and slept on the beach!! Amazing location literally on the beach!! Tents got very hot in the mornings - to be expected though! Showers weren’t brilliant and the hut felt a bit unsterdy. The ocean front tents are lovely, they are on a beautiful beach a little walk away from the busy area. Good bar with nice staff, pool table and lovely food! The speedboat ride to the island. The walk from the ferry to the property was difficult, it would be nice if somebody met customers upon arrival. Staff were overwhelmed sometimes and we got mixed Information regardings of ferries and buses. The bus that was in very poor conditions and the van that picked us up was over crowded, they shouldn’t recommend that company. Bungalow was in need of some repair or maintenance. The beach was clean and amazing. The atmosphere was chill and relaxing. The food was good for a fair price. Bungalow was spacious with a great view.